Dungeness crab is a centerpiece in Oregon seafood. Harvesting the crustacean is worth more than $150 million to the state’s economy. Last month’s story about the “Boat to School” program showed how youngsters are learning firsthand about this valuable crab. But as it turned out, that was only part of the story. 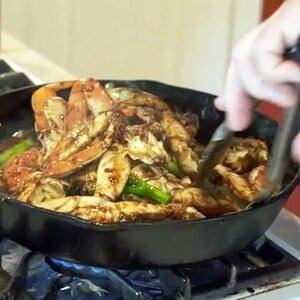 The Oregon Dungeness Crab Commission wants consumers to try recipes that are simple, quick and delicious. This Asian-style dish comes with a savory sauce to compliment the Dungeness crab. Sharp, pungent, salty and spicy with a hint of sweet, black bean sauce contributes a flavor to crab like no other. The crab should be steamed first or use store bought, precooked Dungeness crab to cut your preparation time. Black bean sauce is bottled usually in small glass jars as a concentrated paste. The paste can be found in Asian markets and ethnic food sections of your local supermarket. Using a wok is preferred for cooking this dish, but a large cast-iron frying pan also works well. Clean the crab by lifting up its “tail,” the small flap on the abdomen, and continue to pry off the back of the crab completely. 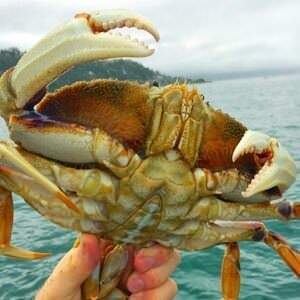 With top of the crab facing up, break into two pieces. Remove and discard gills that are attached to both halves of the meaty section of the body. They look like little fibrous feathers and are pale-white/grayish in color and can be easily pulled away with your fingers. Discard main body shell. Detach crab legs by slicing through the meaty section, leaving a piece of body meat attached to each leg. Slightly crush the leg sections and claws with a meat hammer to allow flavors to seep. In wok or frying pan, heat peanut oil or vegetable oil and quickly saute garlic and ginger. As broth comes to boiling, add black bean sauce, gradually not all at once because this paste is salty. Once taste is to your liking, mix crab in sauce to infuse flavor into legs. Push crab legs upward to sides of wok to create an empty well at bottom of wok. As broth continues to boil, notice a thinker liquid will develop. This brings additional body and flavor to the sauce. Reduce heat to medium high; add corn starch mixture gradually and stir to thicken broth/gravy to your liking. Give final quick mix of crab legs and turn off heat, ready to serve. If using a serving platter, place crab legs with claws pointing out to edge of platter and meaty sections in center. Pour sauce over meaty sections, allow to simmer for 15 minutes and garnish with chopped green onion. Enjoy. This showcases a flat fish you may have missed: Petrale sole. Fick called it “the finest of the flat fishes” that are caught off the Oregon Coast. He said, “When you go into the store, this is really the best sole fish you can get.” Petrale is the firmest of all flat fishes and is prized as mild and sweet. For this recipe, we pour a classic Hollandaise sauce on top of the Petrale sole. It is a perfect match with Dungeness crab. Broil the filets for just a few minutes to cook through. In a saucepan, vigorously stir egg yolks and lemon juice with wire whisk. Add 1/4 cup of the butter. Heat over very low heat, stirring constantly with wire whisk, until butter is melted. Add remaining 1/4 cup butter. Continue stirring vigorously until butter is melted and sauce is thickened. (Be sure butter melts slowly so eggs have time to cook and thicken sauce without curdling.) If the sauce curdles (mixture begins to separate), add about 1 tablespoon boiling water and beat vigorously with wire whisk or hand beater until it’s smooth. Spoon it over fish and seafood for a heavenly touch. Serve immediately or store covered in refrigerator. To serve refrigerated sauce, reheat over very low heat and stir in a small amount of water. Bonus: Fick liberally topped 2 cups of crab meat across the cooked filets and then topped it all with Hollandaise sauce. Bonus: Fick added 6 cups of chopped kale to the recipe. “I like the kale in this recipe because it’s healthy for you and it’s something different that works well with the crab,” said Fick. 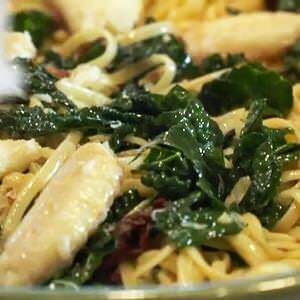 After he sautéed half of the crab meat with sun dried tomatoes and olive oil, Fick added 8 ounces of chicken broth to the mixture and allowed it to cook through for 3 minutes before putting in the kale. A lid was placed on the frying pan to cook through the kale (about 3-4 minutes). Plates are filled and the diners weighed in. 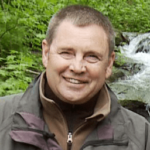 Walt Kastner said, “I like it — it’s simple not that hard to do. I think I could even do it. Jeff Jordan agreed and said “The saturation of the flavor between the meat and the shell was delicious. I really liked it.